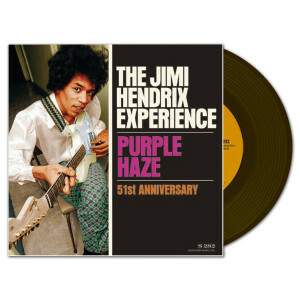 The second single by the Jimi Hendrix Experience, “Purple Haze” coupled with “51st Anniversary,” as it was issued in the UK and Europe, showcases the artistry and mystique of Jimi Hendrix. It beckons us into his psychedelic world just as it did in spring 1967, when it hit the Top Five in the UK between the likes of “Somethin’ Stupid” and “A Little Bit Me, A Little Bit You” on the charts. The two sides presented Hendrix’s space-age take on blues and pop, establishing a momentum of influence that shows no sign of ever ending. This edition—the third release in a unique, ongoing series that partners Sundazed with Experience Hendrix—issues these recordings together on a 45 RPM single for the first time ever in the US, and features the original monaural mixes plus a color sleeve with rare photographs of Hendrix in the ascent of his career.